Malawi flagship league sponsors, TNM have urged football lovers in the country to be part of 10th anniversary of the top flight league celebfrations at Civo Stadium this Saturday when a 18–man squad selected by fans is expected to play against newly-crowned TNM Super League Champions Kamuzu Barracks FC. The fans favourite squad comprises some of the most exciting experienced and upcoming players, some of whom are Flames regulars and includes the choice of a keeper. Nsapato said the winning team will go away with K2 million from TNM and the all logistics for the select team will also be covered by leaguesponsors. 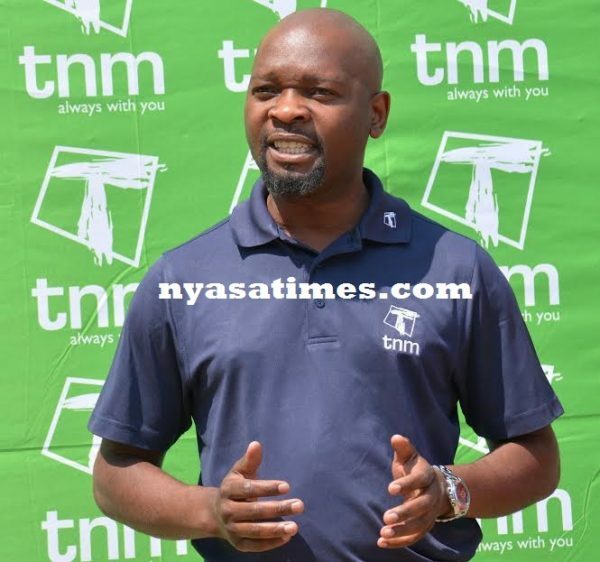 “TNM invites all football loving Malawians to come toCivoStadium this coming Saturday and be part of 10 years celebration because apart from the game itself TNM has lined up a number of activities to keep fans entertained,” he said. According to Nsapato the charges for the game is K500 open stands, K1,000 Covered and K3,000 VIP. Other activities lined up for the celebration include unveiling of a TV documentary that relives the last decade, a K3 million worth of Corporate Social Responsibility initiative by the 2016 Champions and the climax shall be a cocktail event that will also reward 2016 season winners as well as an outstanding team for the last decade. Richard Mbulu,Peter Wadabwa,JafaliChande and ChiukepoMsowoya. Blantyre based players should assemble at SULOM offices, Delemare House on Thursday 19th January 2017 at 7am for departure to Lilongwe.